These are the officers and people that made it possible to start the Sutherland Springs Museum. Our guest book showed 138 people signed in this day. Now with the inside walls that are finished more artifacts can be displayed for enjoyment. Purchased in June 2007 with major renovation started in Jan of 2010. Committed Volunteers that make it possible. Thank you, Ladies. 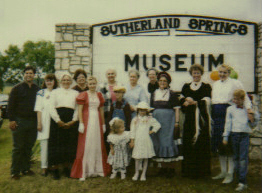 More Sutherland Springs Museum History----How we started. It all started in July 1990 ,when a local San Antonio News Paper ran an ad selling antiques from the local historical site in Sutherland Springs , an 1848 plantation home known as the Polley Mansion. Mr. and Mrs. Linnie owned the plantation and died with no children, so the niece was selling the furniture and the nephews sold the land. Families that were connected with Sutherland Springs were contacted and within three days the money was raised to purchase the two main pieces of furniture, thought to have a historical connection to Sutherland Springs history. These two main pieces of furniture were put in storage. In the course of time information was gathered on how to start a museum and how to incorporate. Dec, 15, 1992 was our first official meeting. In March 1993 Mr. Walker was approached to lease his building off Hy 87 for a museum location. He agreed with a 6 month lease. We moved in with just two major pieces of furniture from the Historic Polley Mansion. We cleaned and painted the inside and had our official Grand Opening on May 1, 1993. Thinking we were just waiting for an opportunity to purchase the building we settled in building sidewalks, a slab in the back of the building was poured for bathrooms, even handicapped accessible. The grounds were improved with a gravel display was built to show the Ferguson ‘s Antique Farm Equipment that was donated. We started fundraisers of every kind: Bake Sales , Raffles, a Golf Tournament and our Annual Christmas Banquet. Then in Nov of 2005 we were told to relocate, due to apartments were to be made out of the current building. But we appreciate Mr. Walker for allowing us the time to get organized and start raising money to set aside for a permanent building. So our County Commissioner, Bobby Lynn found us a metal storage unit that we could store all furnishings inside. So we packed up everything and put it in storage, contacted all contributors that helped us and sent a letter out in Nov of 2005 to notify them. We met and had our regular meetings. We tried to purchase several locations, but they were purchased before we could raise the money. Then in July of 2006 we met about purchasing the old Frazier Building. Which we started collecting pledges for a permanent location for our museum. So, in May 2007 the decision to purchase the Frazier Building was voted on and June 1st, 2007 the final papers were signed. We purchased a permanent building and land off HY 87 in July 2009. The Frazier building was used for auto mechanics and is a 60 x 30 ft metal building with four large garage doors. $ 11,000 in pledges were raised and we were able to put $ 10,000 for a down payment. So during these first months the building was cleaned, moped and painted. Oct 1st, 2007 was scheduled for moving in all the furnishing and artifacts that were in storage. Dec 2008 we were checking into building a web-site. Fundraisers were ongoing of Fish Fries, Bake Sales, Rummage Sales and then asking people to donate old cars or scrap metal. We displayed the artifacts but knew the conditions of the building were not good for the artifacts and way too hot for people to volunteer. So during the hot summer months the museum would close down. Then in Jan. 2010 we started a major 13 month renovation process for the inside of the building into a museum facility, estimated at a cost of $ 33,000. But with much donated in supplies and a campaign of signing the boards if the family purchased the board, we were able to pay for the interior renovation as we came to each aspect of the renovation. We finished the inside renovation in Feb of 2011. We celebrated our RE- Grand –Opening on May 7th, 2011 . The first weekend in May is the Cruise along the Corridor, when all these Car Clubs drive from town to town. So the grounds were completely covered with antique car clubs while the volunteers came and celebrated the finished facilities. Improvements to the Grounds. Nov – Dec 2011…… A Privacy Fence which was built behind the Antique Farm Equipment Display. Then we started building five R.V. sites to help with cost of monthly land payments. Gravel was brought in and leveled out, sewage, electrical and water was run to each site. Scrap metal was donated and hauled off to pay for these sites to be built. We would like to thank everyone that volunteered and donated supplies. We could not have got this far without your help. Thanks Everyone!! !